The economic recovery has gathered pace and political risk has been reduced. It might be the right time to implement reforms. The first half of 2017 saw the European economic recovery gather pace, with unemployment rates falling at a faster pace in the eurozone. With the election of the pro-Europe Emmanuel Macron in France and Angela Merkel securing a fourth term as the head of the most powerful eurozone economy, investors have turned to what the pair could deliver in terms of structural reforms that could potentially fix some of the remaining flaws in the currency union. With popular sentiment toward the European Union (EU) improving somewhat since the Brexit vote, expectations around the future integration path for the union of 27 have also been building. Despite the positive news, the deeper European and eurozone issues have not magically disappeared. Political stress in the EU persists and tensions with Eastern European countries such as Hungary and Poland have not diminished. In the eurozone, the single currency framework is still incomplete. Moreover, further national reforms, especially regarding the French labor market and the Italian banking system are required. Brexit negotiations have been under way for some months but signs of progress are so far limited; one of the key unresolved issues concerns the willingness of the UK to recognize its financial obligations, which, in turn, increases EU budgetary uncertainties. With political risk reduced while monetary policy and financial conditions are still supportive, a window of opportunity to implement reforms may have opened up. But seizing this moment will be a challenge for European leaders, either because improvements in the economic picture could weaken the pressure for reforms or because opposition to reforms is too intense at the national level. The competitiveness of the EU relative to the rest of the world remains a challenge. European countries are generally ranked favorably. 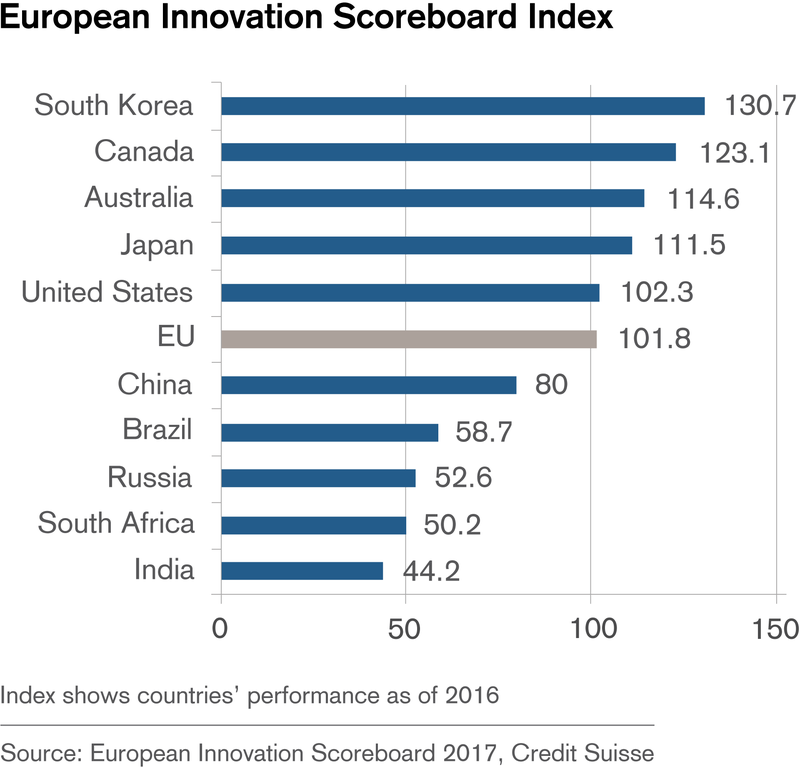 However, looking at the ability to innovate, for example, the EU lags its global peers, according to the 2017 European Innovation Scoreboard. The EU was less innovative than the USA, Canada, South Korea, and Japan in 2016. This index compiles a broad set of innovation indicators such as human resource conditions, public and private R&D expenditure, innovation activities, and patent applications. While there is significant divergence among EU members, the overall index still provides a good benchmark for comparison with other large regions. Where is investment most crucially needed to restore competitiveness? The European Investment Bank (EIB) estimates that the EU would need to invest 130 billion euros more annually to reach the 3% GDP target for R&D investment spending. By sector, the investment gap is widest in machinery and equipment, followed by life sciences/pharmaceuticals and transport equipment strategies. Looking at new technologies, the EIB estimates that EU companies would need an extra 90 billion euros a year to keep up with the latest technological change in high-value-added manufacturing sectors. Infrastructure assets also need to be upgraded, with the annual shortfall estimated at 100 billion euros in energy networks, 80 billion euros in transport facilities and equipment, and 100 billion euros in education-related investments. While this gap is unlikely to close in the short term, more investment in these sectors will remain a key topic in the coming years to keep up with the pace of innovation of other global competitors. Higher investment in technology and innovation is an important trend that we expect at the global level in coming years, as discussed in detail in our investment Supertrend "Infrastructure – Closing the gap". This trend is also visible in Europe and highlighted by the investment gaps discussed above. Among others, efficiency gains via IT technologies will be in sharp focus to support competitiveness in the sectors that have been most impacted by technological change, as we analyze in detail in our Supertrend "Technology at the service of humans".